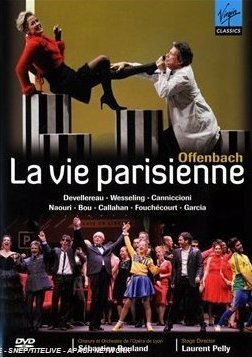 La Vie Parisienne was one of Offenbach's most successful operettas during his lifetime. It was premiered in 1866 and, amongst other things, seeks to parody Parisian society of the period, something many of Offenbach's works do, which contributed both to his popularity and also to his demise during his lifetime. The dramatis personae includes layabout wealthy young dandies, a host of complicit servants (shades of Beaumarchais's Figaro plays, here? ), an irresistible demimondaine, a glove-maker, and visiting foreign nobles. Proper social conventions that ought to have dictated how such different classes of people interacted in the 19th Century are acknowledged and subverted. In view of the subject matter then, one might assume that Laurent Pelly's decision to set the work more or less in the present day would lead to unsuccessful results. Fortunately, the updating has been done rather cleverly, in that it has been confined largely to costumes and sets. This means that everybody is in modern dress appropriate to their character, and the Gare Saint-Lazare has an escalator and a public address system. The dialogue has been adapted to reflect the modern sense of humour, and the famous prima donnas cited by the Swedish Baroness are Bartoli and Dessay, but no changes have been made which affect the substance of the societal hierarchies constantly invoked. The result, for this audience member at least, sounds illogical and incongruous, but succeeds: one feels as if one is watching a drama firmly set in the 19th Century, but the characters and situations seem immediate and involving, and less alienating than they might if the whole thing was filled with ostrich feathers, corsets and crinolines. There are just a couple of instances where Pelly oversteps the mark. The public address system at the station in Act I is amusing at first, but would be more so if it were used less frequently, and if the announcer was not on stage in full view. It quickly gets wearing, and looks strange. I also think we get the fact that Raoul and Bobinet are over-privileged loafers from their attire (vaguely David Beckhamesque in the case of the former, more Graham Norton in the case of the latter) and constant swilling of Veuve Cliquot, and so having Raoul emerge during Act II and strongly imply through his body language that he has just snorted cocaine is somewhat crass, and causes one to lose some sympathy for the character. But these are just two complaints about what is a very detailed production which also contains some real moments of inspiration, in particular a very large slide show of drunken office party style photographs, highly effective at the end of the dinner in Act III, and an inventive entr'acte ballet of street sweepers which draws spontaneous applause from the theatre audience more than once. Musically, the performance is irresistible. The orchestra fizzes as it should under the direction of Sébastien Rouland who keeps things moving and proves to be an excellent judge of tempo. He seldom achieves the tension afforded by metrical give and take within the bar that real masters can give to this music, but he is far from pedestrian, and the ensemble is always tight, which is no mean feat in this repertoire. The chorus is excellent, with a zesty sonority and pointed text, moving as one when required by Pelly in a delightful send up of countless old-fashioned opera productions. Of the cast of soloists, one of the most immediately striking things is just how youthful, slim and attractive everybody appears, except for the Baron who is appropriately more mature. In terms of vocal quality and vocal production, it should be acknowledged that not one of them is first rate, and yet each of them has attributes more essential to this repertoire in abundance, namely the ability to get the text across with clarity whilst doing justice to the score, and an uninhibited and convincing style of comic acting. The award for sheer conviction goes to Jesus Garcia as Le Brésilien who packs more energy into his brief appearances than one would have thought possible. Incidentally, although the role is meant to be a caricature, I'm not sure how I would feel about the flagrant cultural stereotyping if I were actually Brazilian. Much of it, such as the flashness with cash and general lustfulness, is in the original Meilhac/Halévy libretto, but I'm not sure the guns are, and dressing him in the national football strip for his Act IV party feels like an already well made point is being hammered home a little forcefully. Laurent Naouri as the Baron is perhaps the most impressive all round cast member, playing the pompous aristocrat to a T, fully rounded out with a credible descent into vice when his wife's back is turned. As the effective prima donna Gabrielle the glove-seller, Marie Devellereau is occasionally a little wiry of tone, but is so committed and dramatically abandoned that it really doesn't matter. Maria Riccarda Wesseling as the demimondaine Métella gives the most beautiful vocal performance in the show but ultimately makes slightly less of an impact than her colleagues for having prioritised matters that way around. The only slight disappointment in what is a very strong ensemble cast is the Bobinet of Marc Callahan, whose voice sounds a little more like a Musical Theatre instrument than an operatic one and who, whether this is the case or not, comes across as the only non-native French speaker. All in all, this is a hugely enjoyable release with the entire cast entering into the spirit of the performance and looking like they are having a wail of a time with the madcap choreography. Staged opera can be heavy going on DVD but this has such an infectious joy and irreverence about it that I didn't want it to end. High quality sub-titles are available in English, French, German, Italian and Spanish, and the camera work is good, so that one never feels one is missing out on action elsewhere on stage as is often the case with filmed productions. The absence of any extras on the disc is a shame, particularly as the accompanying booklet is little more than a list of who was responsible for what, but these are minor concerns. Nietzsche, of all people, spoke of 'the moments of wanton perfection which this clown Offenbach achieves as many as five times, six times, in nearly every one of his buffooneries' and one can certainly relate to those sentiments after seeing this uplifting spectacle.